How do I search windchill for Creo drawings? I want to filter out CAD models (assemblies, parts, etc..) and documents. I just want drawings with search keywords. Help! I need an article that helps me to find what I want to find in Windchill faster. For example: I want to find all parts that have keyword "Nut". I don't want to see all the models I just want to see the various drawings so that I can find the right size I need. However, windchill pulls up all 1500 models and exceeds the table limit and I cannot find what I need. Also, how can I make search more powerful? Is there a way I can create to create parameters and search for all nuts with a 1/4-20 thread and only search in the Nuts folder? This is just an example, I understand that PTC has add-ons for fasteners, but I also want to be able other objects by parameters. For example. I have glass in different lengths and sizes. Is there a way that I can create parameters in my parts to search for all glass: tempered, width 11-12"). Being able to find parts that are already being used instead of creating new glass parts for each application can save 1,000 of hours of design and purchasing time. Re: How do I search windchill for Creo drawings? 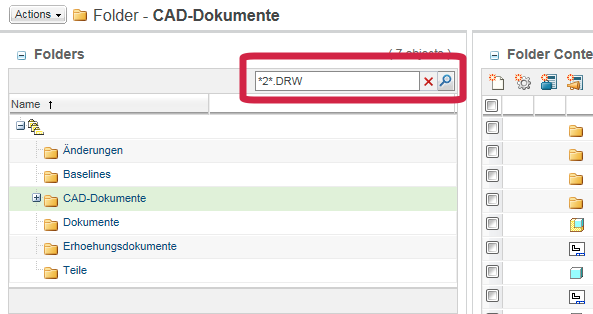 I want to filter out CAD models (assemblies, parts, etc..) and documents. I just want drawings with search keywords. What version of Windchill are you using?